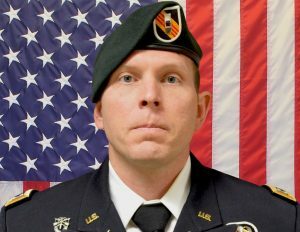 A Bowdoin College graduate who went on to become a decorated Green Beret was one of the four Americans killed in a suicide blast in Syria claimed by the Islamic State this week. Army Chief Warrant Officer 2 Jonathan R. Farmer, of Boynton Beach, Florida, was identified by the Pentagon as among the dead. He graduated from Bowdoin in 2003, according to a statement by college president Clayton Rose. Farmer, 37, received numerous medals, including the Bronze Star and the Purple Heart. Although his family knew he was serving in Syria, they did not know exactly where, according to the Palm Beach Post, which interviewed relatives. Maine’s congressional delegation responded to Farmer’s death, with Sen. Angus King and Rep. Chellie Pingree posting their condolences on Twitter. Sen. Susan Collins issued a series of tweets extending her condolences to Farmer’s family, and to the family of Jason Spindler, a Hebron Academy graduate and entrepreneur who was killed this week in a separate attack in Kenya by the al-Shabab terror group, an affiliate of al-Qaida. Rep. Jared Golden issued a statement Friday night. Farmer was based in Fort Campbell, Kentucky. He joined the Army in 2005, and by 2007 had graduated from the Special Forces qualification course as an engineer sergeant, Bowdoin said in the statement. He was selected to attend further training at the Special Forces warrant officer candidate school and received his commission in 2016. Before serving in Syria, Farmer served 10 tours of duty overseas, including six combat tours in Iraq, Afghanistan and Syria. He is survived by his wife, four young children and his parents, Bowdoin said in the statement. The family was most recently living in Tennessee, according to news reports. Farmer was a native of Florida and graduated from a private high school in North Palm Beach. At Bowdoin, Farmer was a history major and was a forward and captain on the 2003-04 men’s basketball team. The explosion in Syria in the U.S.-patrolled town of Manbij killed 16 people, including one American who has not yet been identified. It was the largest loss of life in the Pentagon’s war against Islamic State militants in Syria and a sign of the potent threat that the group still poses as the Trump administration begins to withdraw U.S. forces from the country, the Washington Post reported. During his nearly 14-year career in the military, Farmer was awarded the Bronze Star with two Oak Leaf Clusters, the Purple Heart, numerous Army commendation and achievement medals, an Afghanistan Campaign Ribbon with one campaign star, an Iraqi Campaign Medal with three campaign stars, a Global War on Terrorism Expeditionary Medal and Terrorism Service Medal, a NATO medal and other honors, the Miami Herald reported.